Wooden barrels have been used for centuries as a means to transport items. 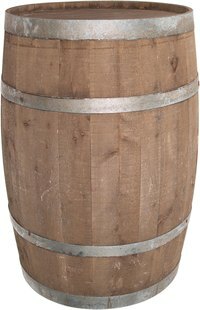 From liquids like wine and beer, to solid things such as meat, wooden barrels were favored because of their durability and capacity to hold large quantities. Not surprisingly, wooden barrels are still widely used today, as many businesses and individuals still store and ship beer and wine in these containers. Though you can buy a wooden beer barrel to store and dispense beer that you’ve bought or brewed, making a custom beer barrel is an even better idea. By doing it yourself, you will have the opportunity to create a custom size and look that perfectly suits your needs and tastes and provides beer storage for years to come. Bend one of the iron barrel hoops by hand until it forms a complete circle. Use a rivet gun to attach the ends of the hoop by driving three large rivets into the metal. This will be the raising hoop. Arrange the wooden staves side by side inside the hoop bent in Step 1. The sides of the staves should be touching each other and form a complete tubular shape when properly arranged. Bend the staves so that they form a barrel shape. To do this, you will need to wet the wooden staves with water. Then, place the wood shavings into the cresset and light them with a match. Place the barrel over the cresset and allow the wood to soften so that the other hoops can be properly placed onto the barrel. Bend two more hoops around the bottom half of the barrel staves. The quarter hoop should be placed two inches above the raising hoop. The bilge hoop should be placed four inches above the quarter hoop. Secure the iron hoops to the barrel with three large rivets driven by a rivet gun. The rivets should be placed closely together one side of the hoop. Do not place rivets around the circumference of the iron hoops. Bend three more hoops around the top half of the barrel staves. The head hoop should be placed at the top edge of the staves. Another quarter hoop should be placed two inches down from the head hoop. An additional bilge hoop should be placed four inches down from the quarter hoop. Secure the iron hoops to the barrel with three large rivets placed closely together with a rivet gun. Level the ends of the staves by going over them with a power sander so that they are all the same height. It is important to ensure that the leveling has been successful so that the barrel heads will be able to properly seal the wooden barrel. Push one of the barrel heads onto the bottom end of the barrel. The barrel head should fit precisely into the stave crozes. Install a barrel spigot. Cut a 1-1/4-inch hole with a hole saw and insert the long end of the spigot into the hole until it cannot go any further. Sand the barrel staves and heads with sandpaper. Be sure to sand both inside and outside of the barrel. Not only will this bring out the grain in the wood, but it will also ensure that no splinters get into the beer or onto your hands as you handle the barrel. Seal the barrel by placing it into a large garbage can filled with water. Soaking the barrel in water will cause the wood to swell and close any leaky areas. Leave the barrel in the water for one week. Once the one-week period is over, remove the barrel from the water and leave it outdoors to dry. Fill the barrel with your beer of choice. Be sure that the barrel is completely dry before filling it. Screw a six-inch heavy duty metal handle to the top barrel head with a power drill. This will allow you to easily open your barrel when you need to empty or refill it. Push the other barrel head onto the top end of the barrel. The barrel head should fit precisely into the stave crozes.